around it and raise still heads above it as though in wordless prayer." Mrs. Walter Scarlett wrote this describing this Rockville Stone Chapel. The Methodist Episcopal Church South built it in 1856. In 1850, circuit-riding ministers brought the gospel to the pioneers here. Camp meetings were held and some settlers came many miles. They arrived in horse or oxen drawn wagons and they came prepared with tents, cook stoves, etc. Some even trailed the family cow so that children could have milk. Camp meetings lasted about 2 weeks. Preaching started at 10 A.M. During the evening, meetings were held by kerosene lanterns, which were sometimes shot out by cowboys who would then stay to listen. By 1852, Suisun Valley was the accepted place for camp meetings. They were often held north of Mankas Corner along the Suisun Creek so baptism by immersion could be performed. 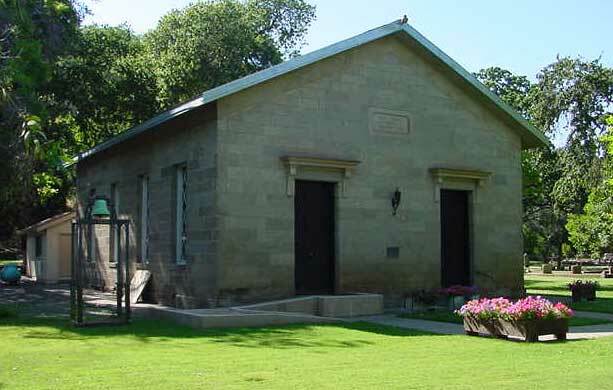 At a meeting in 1855 the idea for Rockville Stone Chapel was born. Four thousand dollars was needed to bring this idea to life. Two thousand was raised and then a wealthy individual gave $2,000 more. In July 1856, John Stilts, Charles and Harry Ramsey, and William Brown met to complete the final plans. That summer saw 100 new converts bringing church membership to 200. One thousand dollars more was raised and the labor was performed by many volunteers. Joel Price and George Whitely, local masons, led the workers. Landy and Sarah Alford donated a 5-acre site for $50.00 (this covered legal fees). The deed by the Alfords was witnessed by Nathan Barbour and Curtis Watson, dated October 14, 1856 and recorded April 6, 1857. Landy Alford and his son-in-law, Nathan Barbour, left Missouri in the mid 1800's for California. They began their travels with the Donner party. When the two parties arrived at the "Hastings Cutoff" Alford begged them to stay on the regular trail. Mr. Alford and the two parties arrived at the edge of the Feather River, it was at flood stage. They secured empty barrels to the sides of their covered wagons and floated them across. The livestock had to swim. Arriving at the Wolfskill Ranch, the parties divided. Mr. Barbour remained briefly at the ranch until he was recruited by General Fremont and joined a battalion. He served for 5 months and then went to Sonoma. Mr. Alford then worked as a carpenter in Benicia and Monterey; he was a frontiersman and loved to hunt. With civilization advancing and wild game becoming scarce, Mr. Alford then went to San Joaquin Valley where he lived out his years. Construction on the building started October 3, 1856. Reverend Woodbridge of Benicia laid the cornerstone. The stone was quarried in the nearby hills, containing volcanic ash and magnesium. This is what gave the stone its light gray color. When it was quarried, it was very soft, but hardened when exposed to the air. The formal dedication was February 1857 and Reverend Bailey was the first pastor. The second Sunday, Robert Waterman (this is who named Fairfield) spoke. The sermon was excellent and he confessed that his wife, Cordelia had written it for him. By 1860, the Sunday school had grown to 35 students. The church split in 1863, at their Christmas Eve service. After the Civil War, the cemetery grew faster than the membership, which was decreasing. In 1879, Lewis Pierce deeded three adjacent acres for $1 in gold. Then J.M. Baldwin deeded 268 more acres as the need for gravesites grew. Occasional services, weddings, and funerals were held. Just after the 1906 earthquake, Reed Wolfskill told about Charles Campbell's funeral that had to be held outside for fear of another earthquake. The chapel was becoming badly deteriorated. Windows were broken and the roof leaked. The cemetery was not being maintained except for families caring for their own sites. 2.) That neither the Chapel nor Cemetery be used for private or secular purposes. 3.) That the plaque remain in its original site. 4.) That the property revert back to the Methodist Episcopal Church South in the event of failure to fulfill this trust. The trustees were J.C. Baldwin, Fred S. Jones, and Charles L. Campbell. The depression of the Thirties came and thus no restoration plans were put forth. The lamps fell, the floor rotted, all the stained glass windows were broken, and the bats moved in. In 1938, Rose Lee Baldwin, the elderly daughter of the Baldwin family, and others wrote letters of concern. Dave Weir of the Solano Republic gave publicity. In March 1939, the board of supervisors agreed to sponsor the project if the county didn't have to provide any finances. August 1939, final plans were approved by the W.P.A. to supply $4,318 in labor and material. A balance of $2,609 was still needed to be obtained by the district, from sales of cemetery lots and public subscription. A W.P.A. engineer was in charge of the labor from State Relief camp in Benicia. The 22 ancient pews were restored gratis at the Hale fruit shed. Restoration began March 1940. The plan called for a new roof, elimination of the low ceiling, interior walls plastered, the stained glass windows replaced, and a new floor installed. It was hoped that the restoration project would be completed by Memorial Day. Special ceremonies were planned for the Memorial weekend. W.P.A. went on a 5-day workweek, and plans were made to hold the ceremonies in the open. That weekend it rained and all but the floors were completed. Temporary repairs were made and 200 guests crowded into the chapel.At 10:30 A.M., the last surviving minister who had preached in the old chapel, Reverend C.C. Black, rededicated the historic monument. Suisun's Episcopal choir sang "America" and "God Be With You till We Meet Again". A Free Will Offering was taken and $1,045 was received. A $1000 bill was in the offering and to this day no one knows who donated it. The gravesite ceremonies by American Legion were held as the rain ceased.